Even if Mars became cold and dry place long ago, though its still a mysterious world with many intriguing secrets waiting to be unveiled. 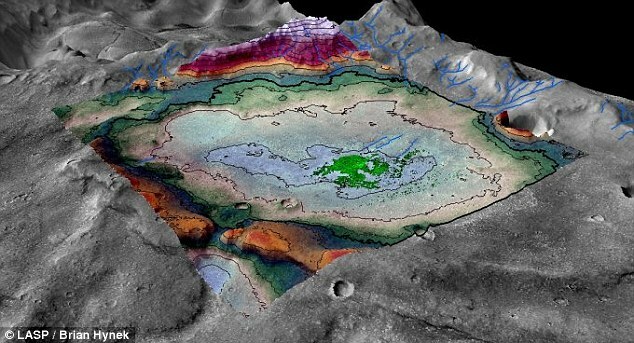 Recently, a team of scientists have uncovered evidence of an ancient martian lake that likely represents one of the very last places where liquid water existed 3.6 billion years ago. The scientists examined an 18 sq. mile chloride salt deposit, roughly the size of the city of Boulder, lies in the Meridiani region near the location of NASA’s Opportunity rover. The region is similar to the one in Utah at Bonneville Salt Flats. Such large salt deposits are considered as evidence for a now-evaporated large body of water. said Dr. Brian Hynek author of the study published online in the journal Geology. The lake level eventually rose and breached the drainage divide, leading to significant outflow. The remaining water evaporated and eventually precipitated the chlorides at the lowest levels. But what’s interesting about this formation is its age: digital terrain mapping and mineralogical analysis of the features surrounding the deposit indicate that this one-time lakebed is no older than 3.6 billion years old, well after the time period when Mars is thought to have been warm enough to sustain large amounts of surface water planet-wide. We can be pretty certain that this is one of the last instances of a sizeable lake on Mars. Researchers were able to estimate lake’ salinity due to the depth of the remaining salt deposits, and it was only 8% saltier than the Earth’ oceans, so it would have been a relatively freshwater region where life might’ve thrived. However, that other factors such as acidity levels were not included in the scope of the study. Artistic illustration of the Martian chloride deposit and surrounding terrain. ©LASP/BRIAN HYNEK. Follow us @CosmosUp, Facebook and Google+.